Mother of Hadar Goldin, who like Oron Shaul died in Hamas war and whose body is being held, decries unprecedented concessions to Gaza. Leah Goldin, the mother of IDF soldier Hadar Goldin who fell in Operation Protective Edge last summer and whose body is being held by Hamas, sharply condemned the government on Thursday for giving Gaza residents "gestures" for Ramadan without demanding Goldin's return as a condition. "Returning fallen soldiers at the end of combat is a humanitarian directive that the entire world at all times abides by," Goldin stated to IDF Radio (Galei Tzahal). "Therefore, before they give an easing (of access) and humanitarian gestures to Gaza, I want my son to return." Goldin, a first lieutenant in the Givati Brigade, was killed last August 1 at the height of the operation after Hamas terrorists breached one of several ceasefires to attack his unit on the outskirts of the city of Rafah. Likewise, Golani Brigade First Sergeant Oron Shaul was was killed on July 20 during clashes between Hamas infiltrators and the IDF in the Gaza Belt and his body was also captured by terrorists. Regarding the "gestures" for the Muslim fast month of Ramadan, Israel made numerous unprecedented concessions including direct buses for the first time from Arab towns in Judea, Samaria and Gaza to the Temple Mount in Jerusalem. Certain "gestures" have been cancelled or temporarily pulled after shooting, stabbing and rocket attacks that quickly flared up with Ramadan. "If they're speaking about humanitarian gestures - then the return of our sons Hadar Goldin and Oron Shaul is the first and necessary condition for conducting any humanitarian gesture to Gaza," emphasized the bereaved mother. Goldin stated, "I want them to return his body. The state has obligations first of all ahead of any agreement to return Hadar home - you don't leave a single soldier on the battlefield." "We rely on the state of Israel and the IDF who are working to bring back the soldiers left behind - Hadar and Oron." Earlier this month, Goldin's family met President Reuven Rivlin at the Presidential Residence in Jerusalem, after the president claimed before Arab residents in northern Israel that the rehabilitation of Gaza was an Israeli interest. 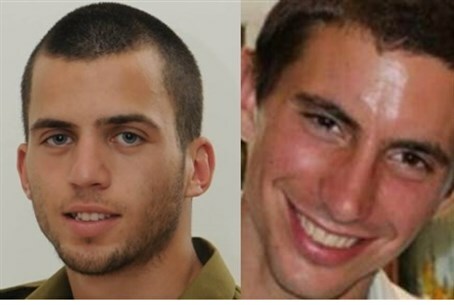 "Any process planned in connection to the Gaza Strip must start with the return of the fallen Hadar Goldin and Oron Shaul," Tzur Goldin, the twin brother of Hadar, told Rivlin in the meeting, demanding that rehabilitation be dependent upon the return of the two.